SDAAFE invite you to attend our first installation dinner on 04/25/15. As an active advocate for Asian community, SDAAFE has been working hard alongside with other Asian groups for your rights and equality. SDAAFE is a non-partisan political action committee with more than 1900 members and growing. Promoting active involvement in public affairs. Defending our community interests and mobilizing Asian American community on issues of concern. We have been working hard to unite Asian Americans to voice our concern on issue regarding California legislature SCA5 in early 2014. In the November Election 2014, we teamed up with other Asian advocate groups to motivate San Diego Asian American voters to go out to vote. Together, we boosted the turnout rate of Asian voters and especially that for Chinese American voters, which, historically, was the least active voting group. The fund raised from the Installation dinner will contribute to the annual operation cost. This event also serve as an good opportunity for the public to know more about our organization. 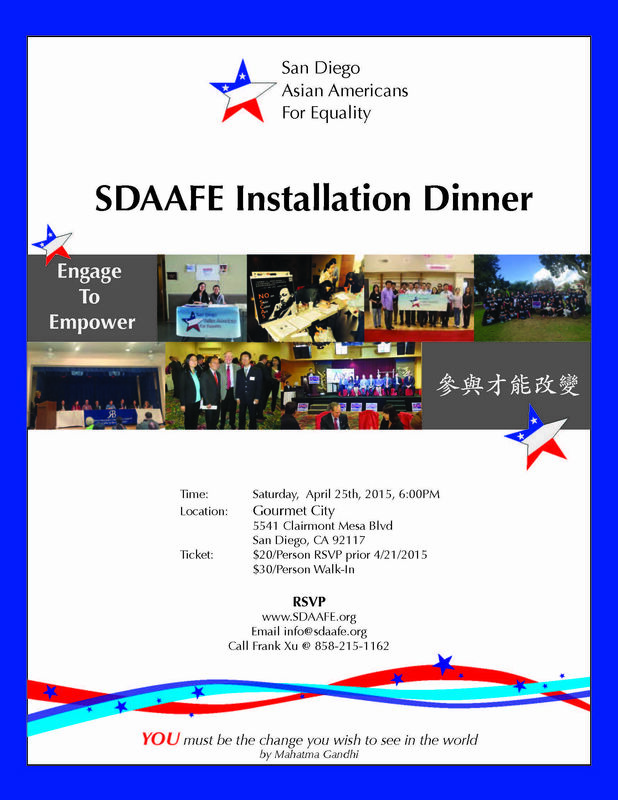 SDAAFE welcome you to join us if you would like to serve for the common welfare for Asian community at San Diego. * You have to be a US citizen or Permanent Resident to contribute to SDAAFE since we are a registered political organization.